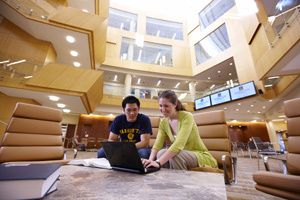 The law library and law school offer wireless Internet access throughout Eckstein Hall for Marquette University faculty, students, and staff. Visit Law School Technology to learn more about MU Wireless in Eckstein Hall. Use your law school credentials to access subscription databases. This is the same username and password that you use to check Marquette email, or log into Checkmarq. A limited number of laptops, both pc and mac, are available for law students to borrow. For those who have not configured their laptops for wireless or those outside the Marquette community, ethernet cables are available for check out at the circulation desk.